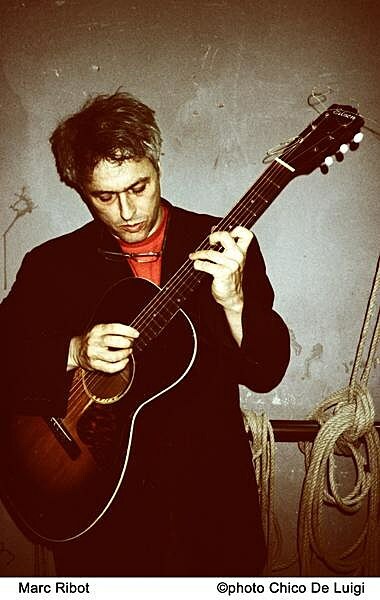 “Everything You Ever Wanted to Know About Marc Ribot (but were afraid to ask)” is the first of the Stone‘s new Monday night seminar series and, as previously mentioned, it happens tonight (1/4). The first 13 of those events, which the venue describes as “a special series of workshops, lectures, seminars and Q&As on a variety of fascinating subjects by some of the world’s most unique, cutting edge musical thinkers,” are laid out below and cover a huge spectrum of musicians and topics. Ribot will be performing as part of the NY Guitar Festival on January 14th (doing a live improvised score to Charlie Chaplin’s “The Kid”) and playing with his stellar group Ceramic Dog on February 2nd at (Le) Poisson Rouge (with Skeletons, who played NYE and New Year’s Day shows at Zebulon, opening). Tickets for the LPR show, which is also part of the NY Guitar Fest (more on that later), are on sale. Another interesting, very different Q&A event is also coming up. On February 23rd, Santos Party House will host “Ask Andrew W.K. Anything: An intimate evening of unpredictable performance.” Presumably the event is being held to further address the internet rumor that Andrew W.K. is an actor who plays the part of Andrew WK. Tickets are on sale. In other news, he’s re-releasing his formerly-import-only-record Close Calls With Brick Walls with a new “lost” disc Mother of Mankind on February 23rd, and he’s on this year’s Warped Tour. BEGINNING IN 2010 THE STONE WILL HOST A SPECIAL SERIES OF SEMINARS DEDICATED TO CONTEMPORARY MUSIC PRACTICE. Seating limits and admission prices may vary each week. Please check details and arrive early! STUDENT DISCOUNTS DO NOT APPLY TO SEMINARS. In the interest of updating and supplementing contemporary music education, The Stone initiates a special series of workshops, lectures, seminars and Q&As on a variety of fascinating subjects by some of the world’s most unique, cutting edge musical thinkers. Made available to musicians, students, critical thinkers and the general public at affordable prices, all curricula will be decided by the musicians themselves and presented at the Stone at 7pm every Monday night. 8PM to 10PM–TWENTY FIVE DOLLARS: Open to all. May bring instrument, MUST bring question! An intimate solo performance followed by a Q&A/ discussion period. 7PM to 9PM–TWENTY DOLLARS: Open to all. Musicians may bring their instruments. Uri plans to perform a solo piano concert and then speak about several of his musical projects. There will then be a Q&A period, and time for pianists and musicians to perform and discuss their own work with Uri. DUCK BAKER–Approaches and strategies for modern composition, arranging, and improvisation, for fingerstyle guitar. 7PM to 11PM–FIFTY DOLLARS for personalized instruction, restricted to 15 students with their guitars–TWENTY DOLLARS to simply sit and observe. A lecture/demonstration in which Duck Baker will share some of his arranging ideas, especially regarding the music of Herbie Nichols and Thelonious Monk. Ways in which these arranging tools can be used for other jazz tunes, traditional tunes, and original composition will be discussed, as will how one can expand on arrangements by improvising, both with and without independent bass lines. Free jazz and free improvisation will be touched upon as well, and students are encouraged to bring any and all questions about musical problems encountered working in these areas. A few arrangements will be illustrated in detail, and students should expect a very hands-on teaching approach. 7PM to 9PM–TWENTY DOLLARS: Open to all. NOTE EARLY START TIME! 4PM to 7PM–TWENTY DOLLARS: Open to all. 7PM to 830PM–TWENTY DOLLARS: Open to all. A demonstration/ lecture followed by a Q&A period by one of the foremost improvising violinists in contemporary music. String players may bring their instruments, but all are welcome. 7PM to 9PM–TWENTY DOLLARS: Geared for composers and instrumentalists but open to all. Bring your questions about composing or performing to the free-wheeling two hour class given by Downtown improviser and composer Erik Friedlander. Erik will address your questions and will speak about being a working musician/composer in 21st century as well as about pizzicato techniques, improvising strategies, and getting the most out of practice time. Players and non-players are invited to attend and cello players are invited to bring their instruments. If you would have a particular technical issue or question and would like to perform just let Erik know by dropping him an email at stoneworkshop@erikfriedlander.com. The versatile keyboardist, guitarist, studio owner, engineer shares many secrets in this essential seminar on making records in the 21st century. The remarkable virtuoso trumpeter speaks about his techniques, practice methods and more!